2019-04-05: Build thread: go here. 2019-03-17: No more orders are accepted at this point. Nine builders have signed up. Now the material is going to be ordered and shipped to the builders. 2019-10-24: I am now accepting orders. If you are interested in this project, please first familiarize yourself with the documents shown below (Assembly Guide, BOM, Bundle Request Form), then fill out the Bundle Request Form and send it to my email address. You can find my email address at vocoder.hoerold.com near the end of the web page. 18-channel stereo vocoder (excl. supply). This is the vocoder BOM, excluding the components needed for the power supply. Vocoder DC/DC supply. This covers components available at Mouser for the DC/DC converter based power supply. Vocoder LDO supply. This covers components available at Mouser for the alternative LDO based power supply. I will accept orders until the first 12 candidates have signed up. As is customary at muffwiggler's, I will post the candidates' aliases on the first post. Once the list is full, I will accept payments. After all payments are made, I will order the parts and PCBs as requested per the Bundle Request Forms sent to me. Find the assembly and tuning guide here. For a good pricing indicator (final prices for panels pending), see the bundle request form. 1) A PDF that contains the complete assembly tables and the BOM. 2) An Excel spreadsheet that I've built up over the last couple of years and that I've just updated with the latest component cost. I believe for many of you the spreadsheet is of strong interest as it essentially gives you and indication about the total cost for the BOM. 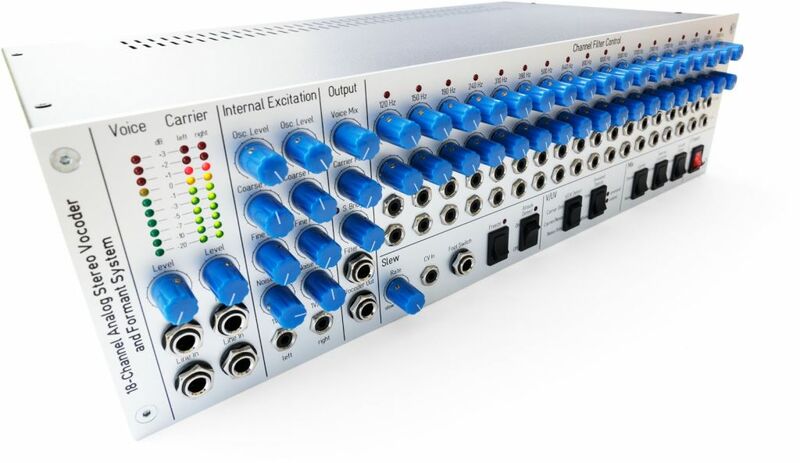 What do think about this 18-channel analog stereo vocoder? I've been working on this project over the last couple of years but now it's time to check the community's interest. Over time, I hope we get to know each other better on this thread. As I am new to this forum, HTML is not enabled for me (yet), so I can't embed the video here. Quite amazing! Love it. Look forward to your explanation in due course. people around here will want making that vocoder! I think it sounds and looks great! I like the stereo feature and find that the voice/unvoice detection sounds very good. Also I like its clean compactness and UI design. If I can afford it (PCB's? panel option? Full kit?) I would be interested in building one. On a sidenote: As far as I know Kraftwerk are a bit picky with usage of their music by other people. So I hope you won't get into any trouble with your video. I hope, if/when you offer kits, that there will be rack mount option - or perhaps the case has optional rack ears? Amazing build and great demo! Would bananas fit instead of jacks ? I would love to see more information on this - build docs / BOM. But I would definitely be interested in a PCB/panel/case set if I could swing it. Great work on this! Sounds great. I would be interested! WOW,awesome,much better then kit J.Haible ever did. Lots of comments. Keep 'em coming! Instead of quoting each post, I'll try to summarize them here in this post. Unfortunately I am not allowed to use HTML to make this post more readable. Let's get one thing out of the way: there are no plans to sell a DIY kit or to organize a group buy. The VoIS is literally built using about 4000 components and I can't possibly organize this. I do, however, plan to provide the bill of materials (BOM) with a suggested distributor for each and every component, including the order code. That should help you build your order lists quickly. I've tailored that list for ordering from distributors from Europe but it should be fairly easy to adapt for those who plan to buy components from the US. In fact, in some cases it was cheaper for me to buy components from one distributor in the US instead of Europe. Oh, and about the 4000 components: I mean it when I write "for the ambitious enthusiast". From procurement/availability point of view though, you may actually be surprised about the use of well-known components that are easy to get such as, of course, the TL074. Zoom in at the analysis/synthesis channel filter board on the dedicated vocoder web page and you'll notice the parts in use. And since I am already on the subject of availability, to keep the noise at a minimum, I chose the MC33079P for the 8-pole filters but you can just as well use the TL074 if you prefer (I've tested it). If the number of components sounds intimidating, don't bail on me just yet. I have prepared a mono version of this vocoder without internal excitation, patch bay, and silence bridging. If you feel the high-end option is out of your reach, please bear with me. I will revisit this option once I have collected enough input from the community here. The mono option I have in mind has about 2600 components. In general I am thinking of selling a combo of PCBs and the front panel, probably starting out with a limited run of 12 sets (PCB + front panel) to get this going. Regarding the question about the rack mount: I was definitely planning to sell the front panel with these "ears" as you called them. Here I'd need some feedback on where to find the proper dimensions. I assume that most of you would like the regular front panel for rack mounting purposes, so that's the way to go. As far as the case goes, the screw holes are made to fit the rack case "Slim Line 03/230 3U 4mm" from HiFi2000.it. At this point I need to make clear that I am not affiliated with any suggested sources and you may choose to buy components elsewhere. But in this particular case I wanted to make sure things combine seamlessly. The channel boards are designed with a notch to hold the top cover of the case in a way that the 3 mm front panel doesn't bend, e.g. when you pull the plugs from the front panel. By the way, I got my panel done at Schaeffer AG. I plan to release details over time as I prepare some more documentation so you get a better feel about this project. In the next step, I will provide a general overview about the parts used, such as resistor specifications, capacitors (e.g. 1206 SMDs are used as blocking capacitors). It will also contain some comments about the procurement of the potentiometers. Regarding the comment about Kraftwerk being picky about using their music, let me be very clear: we did not use any sound snippets from Kraftwerk. All sounds are generated on our own analog synthesizer. And if you compare the simple demo with the original, you'll notice quite some difference. So I hope that's no basis for getting in trouble with them. The purpose of the video is merely to demonstrate the capabilities of the vocoder. About the use of 3.5 mm (1/8 in): I know there's a bit of a difference between the 1/8 in = 0.125 inches and the 3.5 mm that actually convert to 0.138 inches but I thought it was common to use 3.5 mm or 1/8 inches for these types of plugs. Should I just remove the "1/8 in" from the vocoder brochure? Regarding the use of banana plugs: I suppose you asked whether you can use them for the patch bay instead of the regular 3.5 mm patch cables. I guess you can use them if you file them off. :-) Seriously though: the plugs in use (CL1384 or the higher-quality CL1384G) have an internal switch. If nothing's plugged in, the CV-in is directly supplied internally with the signal from CV-out. In case you plug in a patch cable, the CV-in is disconnected from the internal connection and supplied via the patch cable from a different CV-out instead. about the 4000 components: I mean it when I write "for the ambitious enthusiast"
We all eagerly & patiently will wait for any updates on this DIY Super Stereo Vocoder project! Welcome on Muff and thanks for sharing this great project with us. One question regarding the stereo function. Does it actually pan the odd & even channels independantly ? By listening the sounds demo, it's how my hears interepreted it... but i may be wrong of course. Please count me in for a PCBs + front panel set when everything is ready . EDIT: just saw there is a brochure on your link. I've built a MFOS vocoder and in the process of finishing the Haible vocoder. I'd love one of these provided it's at the right price (a few DIY projects lately have been a little too heavy on the wallet). If anyone is doing rack enclosures like that EMS 3000, I'd be interested in one of those too! Been waiting for something like this. The Haible Vocoder seems to be more of a challenge, on the face of it, for someone of my DIY build experience. Like LektroiD has just mentioned, provided it's not too heavy on the wallet, I'd be interested in the full version. But if, at this juncture, it's too financially demanding, I could reluctantly go for the mono version without the internal excitation... glad this option may be offered as well. Sounds spot-on in the demo! This is just a beautiful product. If I didn’t have a Vocoder in the PCB Pile, I would be jumping on this. 1) On page 3 ("Operating Principle"), there's the sentence "A unique feature of this vocoder is the synthesis of a stereophonic vocoder output from the stereophonic carrier input as each individual frequency band is assigned to one of the audio channels." 2) On page 8 ("Technical Specifications") in the footnotes: "Each bandpass is assigned either to the left or right audio channel of the vocoder output via internal jumpers". This means that you choose for each analysis/synthesis channel filter board whether it is assigned to the left or the right channel. I've simply chosen to assign them alternating left and right going from one frequency to the next. In other words: 120 Hz is assigned to the left channel, 150 Hz to the right channel, 190 Hz to the left channel, 240 Hz to the right channel, and so on. So there's no handling of two audio channels on each single channel filter board. If I had designed it that way, it would have been truly two separate vocoders in one rack. When I designed the VoIS, I first didn't know what I would end up with so I gave it a try. In the end, I was very pleased with the results. It's actually quite impressive how the brain works because you could argue the frequency bands are too far separated that way, the combination of all channels not providing a nice contiguous band in the frequency domain. As far as the discussions about the rack go, I already wrote a few words about it in my previous post but let me focus on that a bit more: I don't know about all the various racks available on the market. I decided to optimize the PCB's to fit the rack offered by hifi2000.it because I've read a lot of good things about them in various posts in the past. The front panel I plan to offer (in the final version with the regular sized front panel that includes the "ears") fits them perfectly. If someone could steer me to a document that provides me with the official dimensioning of rack front panels, I could try to find out two things: 1) the standard dimensions of the front panel and the dimensions and positioning of the ears, and 2) whether the screw holes are the same for any rack option. I need to find out if the latter is also standardized. Looking really interesting, but I'm already running out of space.